Recent evidence has shown that contrary to common belief, grass is not the biggest cause of laminitis in the UK. 90% of cases are caused by an underlying hormonal disorder. Grass can be a trigger factor for the onset of laminitis in horses and ponies suffering from a hormonal disorder but it is unlikely to be the sole cause. This explains why some animals can graze lush pasture with no problems and others are likely to succumb to laminitis. – Obesity and/or an abnormal fat distribution. – A failure to respond to a hormone called Insulin, resulting in abnormally high levels of the hormone in the blood. This is known as ‘Insulin Resistance’ and is similar to Type II diabetes in people. It is the high level of Insulin in the blood that causes laminitis. Insulin is produced by the body in response to the ingestion of sugar. When horses or ponies with EMS ingest grass, it increases the level of Insulin circulating in the blood which exacerbates their existing insulin resistance. This is why they are more prone to laminitis than those without the disorder. This disease is caused by an abnormally high level of the hormones ACTH and Cortisol and is most common in horses and ponies over the age of 15, although it can occur at a younger age. It is caused by the degeneration of nerves in the brain which are responsible for the regulation of the amount of the hormone produced. It is the high level of Cortisol in the blood that causes laminitis.The most common signs of Cushing’s disease are changes to the coat (this can be anything from reduced shedding to the development of a long, thick, curly coat), laminitis, excessive thirst, a pot belly and abnormal fat bulging above the eyes. Both disorders are diagnosed on a combination of the presence of clinical signs, X-rays and blood samples taken to measure the levels of hormones present in the blood. There is a licensed medicine available for the treatment of Cushing’s disease which acts to regulate the amount of Cortisol produced by the body. This is not a ‘cure’ and horses and ponies suffering from Cushing’s disease require lifelong treatment. It can take up to 12 weeks from the start of treatment for the level of Cortisol to stabilise and the horse to return to ‘normal’. Limiting grass intake should be done by using a muzzle or starvation paddock rather than decreasing the duration of turnout, as horses and ponies can consume a surprisingly large amount of their daily intake of grass within the first 1 – 2 hours of grazing.Soaking hay will help reduce the sugar content. The length of time required varies depending on the quality and energy content of the hay, but would usually be between 1 – 12 hours. This is extremely important as it will help with weight loss and improve insulin sensitivity. When the horse or pony is not suffering from a current episode of laminitis, the aim should be to do 30 minutes of exercise a day. The intensity of work does not have to be high and will vary depending on the horse’s fitness and previous level of exercise. 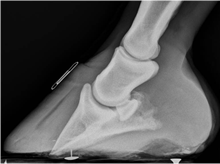 Mechanical overload: Prolonged periods of excessive weight bearing can affect the blood perfusion in the foot resulting in laminitis. This is likely to occur in cases where the horse is non weightbearing in the opposing limb, for example fractures and ruptured tendons. Systemic infections/endotoxaemia: Severe infections such as endometritis secondary to retained fetal membranes or pleuropneumonia and some cases of severe colic can result in endotoxaemia. This condition allows the absorption of endotoxins into the bloodstream. Once there, the presence of endotoxins affects blood perfusion in the feet resulting in laminitis. Steroid induced laminitis: The administration of corticosteroid drugs can sometimes induce laminitis in horses and ponies. Although this condition is widely recognised, the incidence of cases is extremely low. Steroids are a frequently used and often essential medication for the treatment of noninfectious inflammatory conditions including respiratory problems, allergic reactions, arthritis and skin conditions. The type of steroid, the dose and route of administration of the drug along with case selection are all taken into consideration prior to giving corticosteroids. Caution is always recommended in horses that are overweight, insulin resistant or have suffered a recent episode of laminitis. It is widely accepted that when used correctly, the risk of laminitis is acceptable considering the significant benefits of these drugs.